If you own an Aston Martin with the 4.3 V-8 Engine the Timing Cover gasket will leak. Aston Martin designed an improved gasket that made its debut with the introduction of the 4.7 engine. Even though this continues to be somewhat of an issue with a small number of 4.7 engines, this improved gasket has, for the most part, fixed this problem. It seems Aston Martin's strategy for this issue was to delay the inevitable. If a customer brought in a car with a leaking timing cover, the Aston Martin technicians were instructed to apply an external sealant. Invariably, the leak would re-appear at some point, in some cases when the car was out of the Factory's warranty. The only solution is to replace the gasket with the revised version. Labor estimate for this job is approximately 20 hours. It’s expensive whether it’s done by the dealer or an independent shop. Get estimates from both, the difference might be less that you think. As part of this fix, the dealer will change not only the timing cover gasket, but the valve cover gaskets as well, which are also prone to weep oil. The oil reservoir needs to be removed so an oil change will be part of the process. Engine support brackets that attach on to the engine support beam. One other thought, you want this done right; the dealer will have the necessary tools and expertise. The repair starts with protecting the front half of the car with a huge bra like covering. Engine strut brace, coil packs, spark plugs and both valve covers are removed. The engine is supported from the top of the engine bay with an engine support beam secured at each shock tower. The car then is put on a lift and the underbody panels at the rear and front of the engine removed. Wheels, brake rotors, suspension arms, shocks, inner fenders etc. are removed. 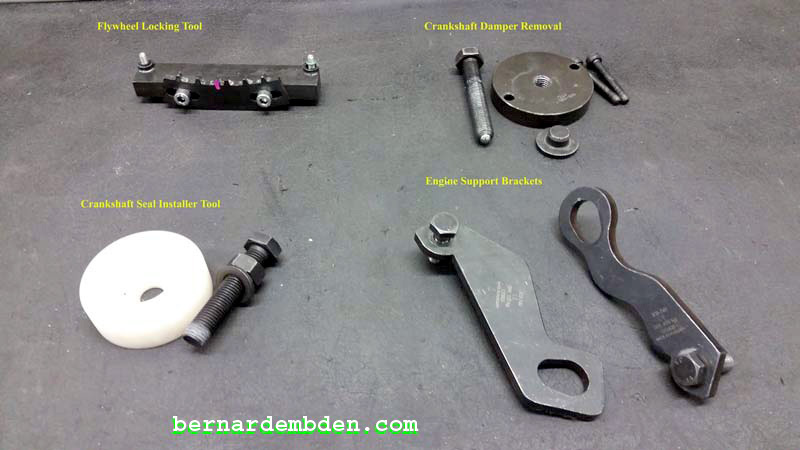 A specially designed support is put under the front steering rack cradle. The car is then lifted up to reveal removed cradle with front sway bar and steering rack attached. Serpentine belt, pulleys, oil reservoir, crankshaft damper, alternator, power steering pump, oil filter etc. Everything is removed to gain access to the timing cover. At this point the Timing Cover can be removed. The Timing Cover is re-installed with the revised Timing Cover gasket. A new crankshaft seal is installed. Suspension cradle with sway bar and steering rack is re-installed. Suspension parts, shocks, springs, rotors, calipers, inner fenders, wheels etc. re-installed. This gives you an idea of why replacing the Timing Cover gasket is so damm expensive, it’s the labor. I would like to thank the Aston Martin technician for taking these photographs.